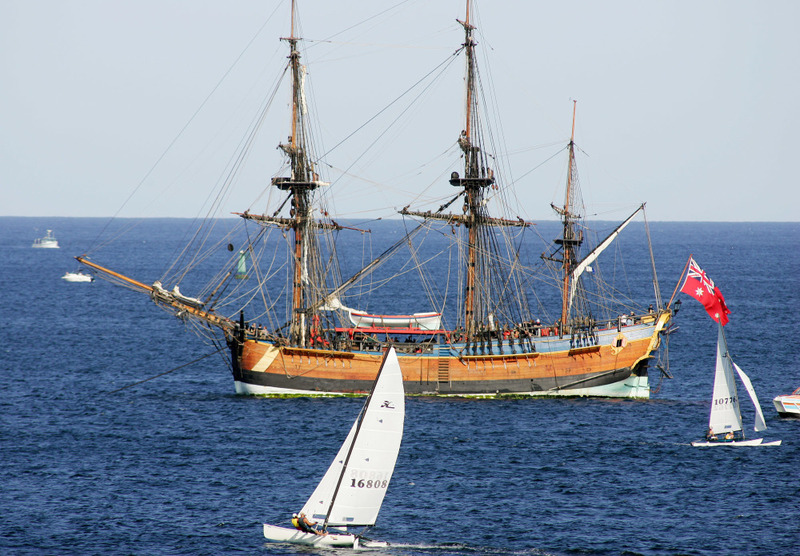 The HMS Endeavour was one of 13 ships sunk when Newport was under siege by the British in 1778. More than 200 years ago, the storied ship of legendary explorer Captain James Cook – the one he used to “discover” Australia’s East Coast – was scuttled by the British Navy. Now marine archaeologists believe they’ve found it off Rhode Island in Newport Harbor. The Rhode Island Marine Archaeology Project is planning to announce Wednesday that it has likely located the HMS Endeavour – later known as the Lord Sandwich – one of 13 sunken ships lost when Newport was under siege in 1778, days before the Battle of Rhode Island during the American Revolution. Marine archaeologists say they are now “closing in one of the most important shipwrecks in world history” – pinpointing its whereabouts to a cluster of five ships. Researchers with the Rhode Island Marine Archaeology Project, a nonprofit organization that studies maritime history and marine archaeology sites, used historic documents in London to map out and analyze sites where the ship might be found on the sea floor. Recent data analysis shows that there is an 80 to 100 percent chance the ship is still in the harbor. Cook, whom some have called “the greatest explorer in history,” was from a village near Middlesbrough in North Yorkshire, England, according to a historical profile from the BBC. Cook learned the world’s waters while serving in the Royal Navy, according to the BBC. In the mid-1700s, he was named the commander of the HMS Endeavour and sent on a scientific voyage in the Pacific Ocean. From 1768 to 1780, he went on three voyages around the world, during which time he encountered Australia’s southeastern coast and claimed it for Britain, according to the BBC. A handwritten letter believed to be penned by Cook after his first trip to Australia was discovered in 2002, BBC News reported at the time. It let the Admiralty know he had returned safely from his three-year voyage to New Zealand, East Australia and Tahiti. After that first voyage, Cook’s ship was sold to a private individual and renamed the Lord Sandwich. It was chartered to the British transport service to carry troops during the American Revolution, according to the Rhode Island Marine Archaeology Project. The Atlantic reported that during a British navy attack in Narragansett Bay, the vessel was scuttled and used as a blockade to stop French ships, which had come to help the Americans, from reaching American lands. Researchers will make the announcement at Wednesday at the Rhode Island Historical Preservation and Heritage Commission in Providence.